You can't keep a good girl dead... but you can play derby with them! SFVRD's The Like OMGs started off October with a ghoulish bout in Antioch, CA against the similarly WFTDA ranked Undead Bettys. Skating with only 11 players to begin with, and eventually only 7 skaters in play after 4 foul outs, SFVRD's scariest skaters proved they always bring their A-game and won against their undead foes 220 to 192. In the first bout of an SFVRD dominated double header, The Like OMGs matched up against the Bakersfield Diamond Divas, the very team that had stolen first place away from them at the Dustbowl Invitational back in March. With a desire to rewrite history and get a little payback, The Like OMGs put their best skate forward and refused to let any jammers but their own make a second pass through the pack. Their determination, months of hard training, and incredible teamwork allowed The Like OMGs to achieve victory with a score of 227 to 53. Not wanting to be outshone by their derby big sisters, The Wipeouts put up a strong front and laid into the North County Derby Alliance. Although several of the Wipeouts had skated with the ladies of NCDA in a banked track bout against the San Diego Derby Dolls just a few months ago, they didn't let their friendship stand in the way of a win. Leaving it all on the track and taking home more than a few bruises, SFVRD closed out the night 226 to 79. In their 5th full length game in just 15 days, SFV's B-Level Travel Team, The Wipeouts, headed down to Corona to take on the Wine Town Rollers' B-Level Travel Team, The Whine Makers. It was a hard fought bout with killer hits and massive blocks. The Wipeouts kept these Temecula ladies in check during the first period, giving as good as they got, but eventually the Whine Makers pulled further and further ahead, drawing on both their hockey skating background and grape stomping skills to take the win. SFVRD's Juniors hit the road, heading out to Bakersfield this time for a little pre-Halloween romp. As usual, The Gnarlies delivered some way out action, proving that roller derby isn't just for the 18 and over crowd. This was the Bakersfield Diamond Minors' final scrimmage before this team dissolves, and SFV was honored to share this special day with them. Our league's youngest skaters started Fall off right with a whirlwind tour of the southland. 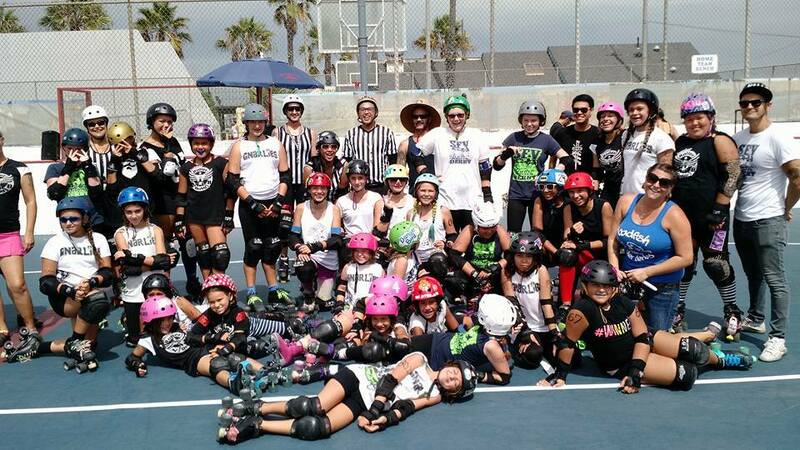 First up was a scrimmage with the up and coming skaters of Long Beach Junior Roller Derby. It was a perfect mix of sugar, spice, and everything nice in the LBC. And don't let their size fool you-- these little ladies know how to hit like a girl! Fearless, fierce, and not afraid to fall or take a hit, our skaters brought it for SFV against the Baby Dolls of the San Diego Derby Dolls. Because the Baby Dolls are a team composed of younger skaters, this was a great opportunity for some of our more junior juniors to shine, and they did just that! We are so proud of our girls! If one thing is for sure, it's that The Like OMGs are never satisfied to just sit around on their laurels. 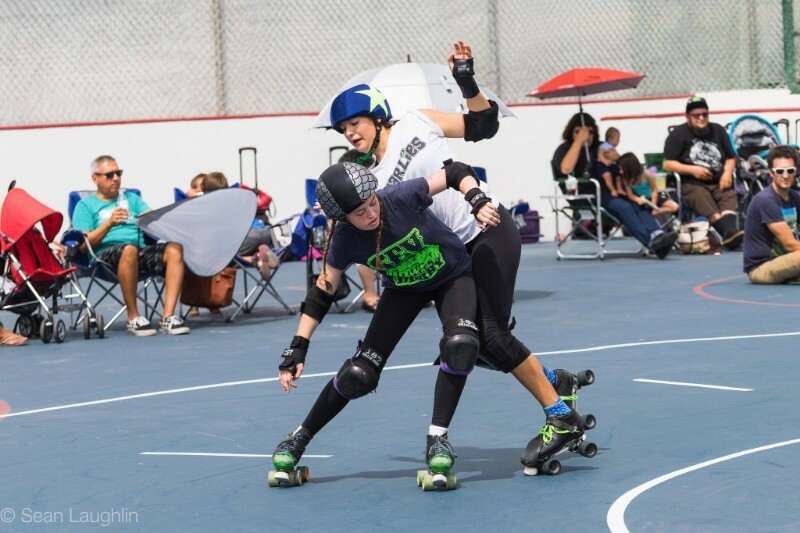 After winning against the West Coast Derby Knockouts in August, our fiercest skaters headed back up to Ventura to take on the Vendolls of the Ventura County Derby Darlins. The Like OMGs were determined to leave no doll standing and claimed victory 212 to 96. Congrats to MVP Jammer Kat Von Reap, MVP Blocker Lethalicious, and Overall MVP Killo Kitty! SFVRD has a number of skaters who are mothers with daughters who also skate with our Juniors team, The Gnarlies. How has this common ground positively effected their mother/daughter relationships and encouraged each other to succeed in derby? How many of us can say that we have a shared experience with our daughters that is outside of the typical mother/daughter roles? As skaters with SFVRD, Danger Bird and I travel to tournaments, bouts, and workshops together. We share hotel rooms and cheer each other on. We can relate to each other's hard wins and tough losses. Just as sure as I model strength and persistence to her, she teaches me what it is to be brave and resilient. We know we are part of a much larger family of moms, daughters, and sisters. My daughter and I both playing roller derby has strengthened our relationship. It helped expand our common ground and created a new way of relating to each other. Since she started playing first, she actually helped teach me how to do certain things on the track. It was quite a role reversal for me and a great confidence booster for her. Roller derby has provided us both a community which is full of people who are strong, hard working, and diverse. We have a place for quality time and something the whole family can be involved in. This is a place where friendships are built and a sense of accomplishment is achieved. We are each other’s biggest fan. What more could I ask for? The sense of empowerment being a part of these strong, confident female athletes was an experience I knew I wanted to give my daughter. It's a sisterhood at every level, the acceptance and encouragement in derby is universal. Watching my daughter have that same reaction after her first practice was amazing. Her sense of determination and grit was inspiring. As she grows up I am so happy for her to be a part of this family that will value and validate her strength and athleticism. Not only do we have each other to share in this experience, but we have the gift of this community. One that bolsters you, empowers you, and through our mutual love of derby, brings us closer together.